MISSION — The Battle of Conway was nearly pulled over for a speeding ticket after four plays. Almost immediately after the rivalry game kicked off, two drives resulted in two touchdowns. The Mission High Eagles scored via two long plays, then the Mission Veterans Patriots hit a home-run pass for 74 yards. The packed house wearing both colors Friday at Tom Landry Stadium was sent into a frenzy. Eagles junior running back Horacio “Tito” Moronta V was the first player celebrating in the end zone. Not long after, Mikey Garcia was taking a 74-yard TD pass from Landry Gilpin to the house. The action kept the fans on the edge of their seats, even though the scoring didn’t maintain that breakneck pace. Mission High ended up on top 24-12, snapping Veterans’ four-game streak in the series. Mission Abram Hernandez can't hold on to a pass defended by Mission Vets Gus Garza during the 1st quarter of play at Tom Landry Stadium on Friday, August,31, 2018, in Mission. 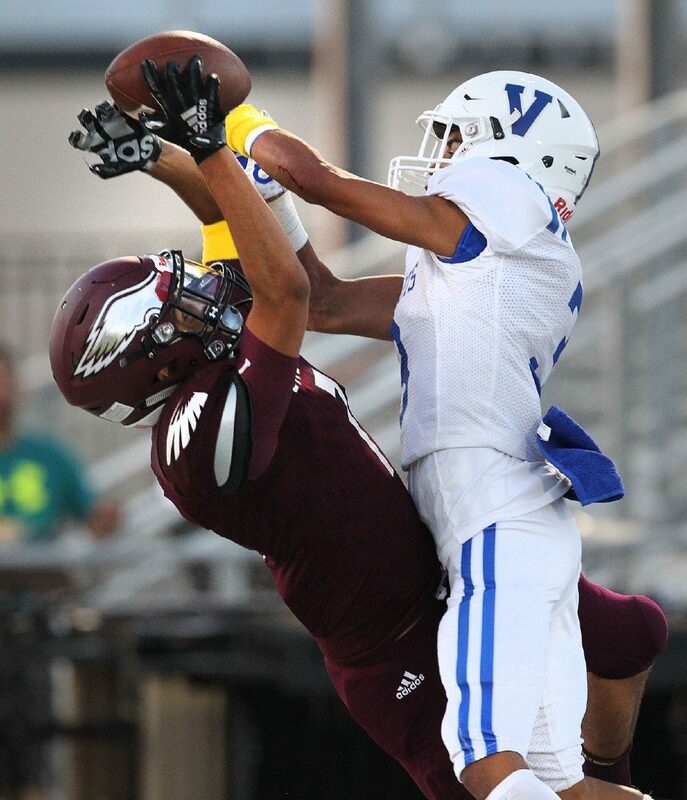 Mission Vets Artie Flores jumps up for a lose ball intended for Mission Reymundo Garcia during the 1st quarter of play at Tom Landry Stadium on Friday, August,31, 2018, in Mission. Mission Sebastian Gonzalez is tackled by Mission Vets Joey Garcia during the 1st quarter of play at Tom Landry Stadium on Friday, August,31, 2018, in Mission. 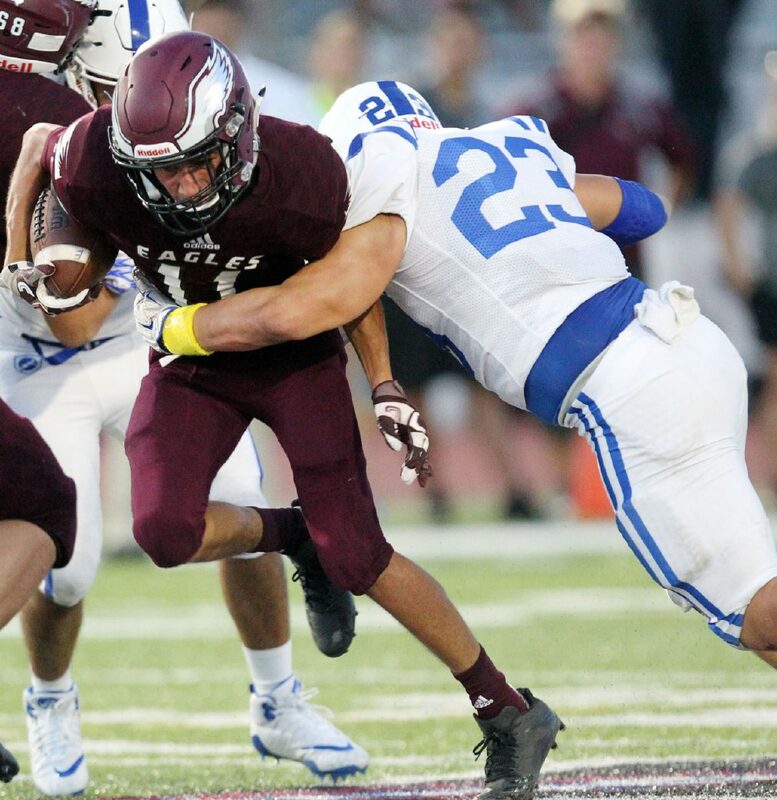 Mission Damian Gomez avoids a Mission Vets defender during the 2nd quarter of play at Tom Landry Stadium on Friday, August,31, 2018, in Mission. Momentum came in many forms during the evening. The early scores left both teams feeling like they could score at will, but that trend didn’t last long. Rene Rodriguez’s field goal for the Eagles marked the only other points of the half. Moronta was a force all game, rushing for more than 150 yards and putting home the early score. Returning quarterback Damian Gomez tipped his hat toward the ultra-effective Eagles offensive line. The upset win for Mission over the RGVSports preseason No. 3 team can’t be analyzed without mentioning the pressure put on Mission Vets quarterback Landry Gilpin. 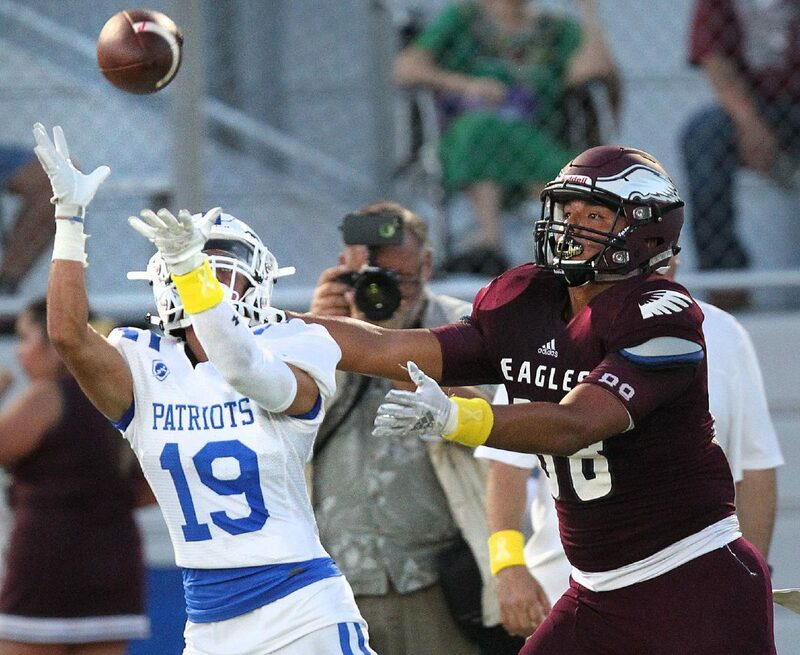 Eagles defensive lineman Ramon Montes came up with a huge play in the third quarter when he intercepted Gilpin on a short pass intended to be thrown away. Montes won’t soon forget his key pick. Mission Veterans may look back on Friday and wonder what could have been. On the second drive of the second quarter, Gilpin missed Garcia on a pass that would have been just as wide open as their first score of the game. The Patriots defense forced turnovers and created a field-position advantage, but the offense didn’t cash in on those chances. The reigning Monitor All-Area Player of the Year, Gilpin had a strong individual effort as he frequently escaped the pocket and made plays with his legs. He scored a rushing touchdown to put Veterans up 12-10 late in the third quarter. He finished with only 77 rushing yards as multiple sacks bogged down his numbers. 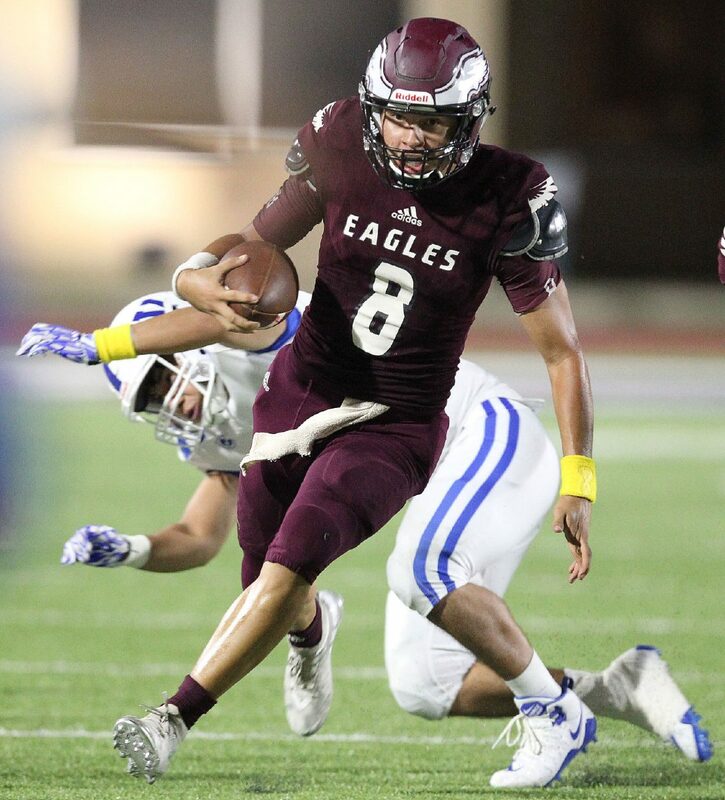 He was outdueled by Eagles junior Damian Gomez, who had only 60 yards rushing but punched in two QB-keeper TDs, even scoring one after a short injury break. The former Eagles quarterback and third-year coach Koy Detmer knew his team would have to give everything to earn his first win in the rivalry from a coaching perspective.